Scaling business operations is one of the imperatives for infrastructure service providers to be able to serve an ever-growing customer base and to operate and maintain large (or larger) infrastructure environments with the same team size. An inability to scale is a threat to new business opportunities and future revenue growth. However, hiring the necessary talent with the right skills is becoming more difficult and expensive. Hence, tech CEOs and technology product managers of infrastructure service providers must find alternative ways to leverage existing data, external data and human knowledge to scale their digital business operations. By 2023, 75% of infrastructure service providers that deploy intelligent automation will leverage a central knowledge unit to prepare for autonomous operations, up from less than 30% in 2019. Tech CEOs and technology product managers of infrastructure service providers struggle to scale their business operations due to constantly recurring tasks per client. This has an immediate impact on their ability to serve a growing customer base and operate large customer infrastructures with the same or smaller team. Hence, limited access to those resources has a negative effect on growth and revenue. Intelligent automation is a promising approach to address these challenges. However, delivering on the promise of scalability, an intelligent automation solution depends on the accessible information it can leverage to run infrastructure environments autonomously. The more access an intelligent automation solution has to a continuous growing set of information and the more an intelligent automation solution learns over time, the smarter it gets and the more it acts autonomously. 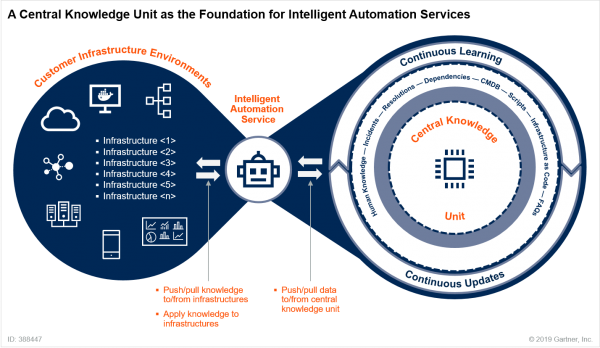 A central knowledge unit is the foundation for the reusability of information that can be used to intelligently automate infrastructure either in a vertical or in a horizontal way. Furthermore, a central knowledge unit as the foundation for intelligent automation is the new natural way for infrastructure service providers to run and scale their digital operations and to enable clients to engage at digital touchpoints. Gartner has identified a focused approach to intelligent automation supported by a central knowledge unit, which tech CEOs and technology product managers of infrastructure service providers can use to scale their business operations and turn toward autonomous operations.